I am back after a short hiatus and have been waiting impatiently to share with you my travel stories! Today we are going to focus on Austrian Wine Tales, which is purely a journey through a glass; a sip of a wine glass. This year I visited Austria; Vienna in particular which is the capital and largest city of Austria and one of the nine states of Austria. Vienna, also described as Europe’s cultural capital, is a metropolis with unique charm, vibrancy and flair. It is a city of culture, music, art, palaces, culinary delight and not to forget its wines! Let me take you through a journey through a glass which is inspired by Austrian Wine Tales. Vienna and its wines are inseparable. No other city in the world has larger vineyards within its boundaries than Vienna. 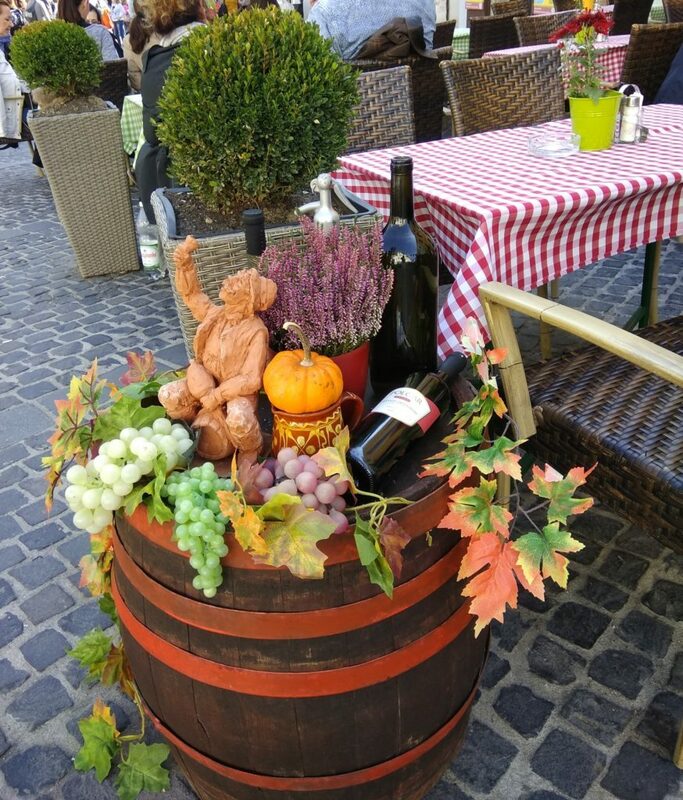 Wine-growing in Vienna contributes to the city’s cultural identity and is an important economic factor for the Austrian capital. So obviously, I did have a great time tasting and drinking different types of wine. We explored the city by night and went for a ride on the Giant Ferris Wheel. Later, we visited a Heurigen – a traditional wine tavern, at the picturesque village of Grinzing. In Vienna, the homely taverns serving fine wine and buffet food – are legendary. We were offered ¼ litre of red or white wine made by local winegrowers and enjoyed an absolutely charming evening with great music. It was a lovely experience to experience firsthand a wine tavern. It was exactly as I had seen it in the movies; people talking, laughing, local musicians playing, chaos, with people eating, drinking and having a good time. Another fascinating wine-growing region of Austria is The Wachau. The Wachau is a UNESCO world heritage site and region of natural beauty, and lies in the Danube valley between the towns of Melk and Krems. The extremely diverse geological terrain, coupled with the construction of terraces in the best aspects, and the cultivation of vines on these steep inclines by the Bavarian monasteries during the Middle Ages, has resulted in a spectacular and unique Wachau landscape. The Principal grape varieties grown here are Grüner Veltliner and Riesling. The Riesling was brought from the Rhine to the Danube in Austria and is now – next to the Grüner Veltliner – the most important white wine variety in the Wachau. Young Riesling wines exude charming fruitiness and flavour, and can develop into great and complex wines through ageing. The Riesling is a noble white wine capable of attaining excellent quality by international standards. High-quality Rheinriesling must be made from fully ripe fruit that have had a good measure of autumn sun before being picked late in the season. While cruising on the Danube river through the Wachau Valley, on the boat, had a chance to taste the Sturm! Sturm is a young wine that is basically fermented freshly pressed grape juice. To me and my friend, we thought it tasted like our Indian local toddy! The toddy drink in India is produced by fermenting the sap of palm trees and is also known as Palm Wine. Sturm marks the beginning of autumn and the harvest season for many locals. A trip along the Danube in Lower Austria is a dream come true. Visitors can look forward to scenic countryside, the Wachau (a UNESCO World Heritage landscape), lush terraced vineyards, blossoming apricot trees, historical buildings and archeological parks. Autumn is the season for harvest festivals. At these traditional festivals, people give thanks for the year’s good harvest. Many wear special local costumes, and local clubs carry out traditional activities during the celebrations. At the thanksgiving celebration in Spitz/Donau on October 2, locals get decked out in traditional garb and have a procession with abundant harvest bounties to the church where a special mass is celebrated. Then the new wine and other harvest treats are served and there is dancing by a band in traditional costumes and a folk dancing group from Spitz. Lookout for my next post! Till then keep traveling and keep sharing the stories here. Awesome Maria.. sounds amazing.. looking forward to hear more from you.. Thank you Jenny 🙂 Keep a lookout for more posts! Very nice…felt like I m traveling with u! !